In a society that seems to be on the up after what has been classed as one of the worst recessions of our time, hip-hop and rap have also been on the increase around Ireland. Our country has always been seen as a small talented island with amazing talent amongst the rock scene, with bands such as The Cranberries, Thin Lizzy, The Villagers, Ham Sandwich, Windings, Shardbourne, Walking on Cars, and, And So I Watch You From Afar. Rap or Hip-Hop always enjoyed more of an underground scene but in the last few years, more and more acts are gaining popularity around our small island. And it would seem that most of the talent is coming out of Limerick too. With Rusangano Family and Naive Ted garnering attention from the Irish media, it was only a matter of time before other groups were jumping out of the woodwork and blowing us away with their unreal talent. One group that immediately stands out and should grab your attention is Same D4Ence (or Same D! as they are referred to amongst the music community). Same D4Ence consists of Size, Hazy Haze, and MCB and have only been a part of Limerick’s scene since 2014 but in that time, they stormed onto the stage at Make a Move Festival and absolutely killed it, making the walls sweat from the heaving crowd who couldn’t get enough! They have an EP out now called ‘Basic Instinct’ that features production by mynameisjOhn and Naive Ted. They have had several memorable shows around Limerick and will be taking the show on the road around Ireland soon. In the meantime, Olivia got chatting with Simon aka Size about being in Same D, growing up in Limerick, and their opinions on what goes on around the city. Tell me how you first formed Same D4Ence? Did you all grow up together? Well firstly, before we became the group known as Same D4Ence, the three of us grew up together in The Island Field, in Limerick. We were close as younger friends and became closer over the years. I started writing at a very young age and told the boys about it. After that, MC B and Hazey Haze started to build an interest in writing and soon the three of us were rapping and writing in families’ coal bunkers and sheds. It wasn’t until about 2013 when Same D really came together as a group to develop and create our music. Were you always into Rap and hip-hop? We were all into Rap and Hip Hop since a very young age and since then we’ve been listening to music by people like Eminem, DMX, 2Pac, 50 Cent, The Game, Tech N9ne, Kendrick Lamar, J. Cole, Yelawolf, G Mo Skee, Slaughter House, Royce Da 5’9, Passionate MC, Flawless and a whole lot more we could mention! Hip-hop and music have always been a massive influence in our lives. Same D4Ence are relatively new to the music scene but you’ve made a massive impact with a lot of Limerick musicians, how does it feel to be part of the music community? It feels great! To have people like Naive Ted and Rusangano Family supporting you is incredible. Also, we have to mention out extended family, DJ DShii, and rappers Bubbha Jay & Dred. It’s a business founded on friendship and love for music. 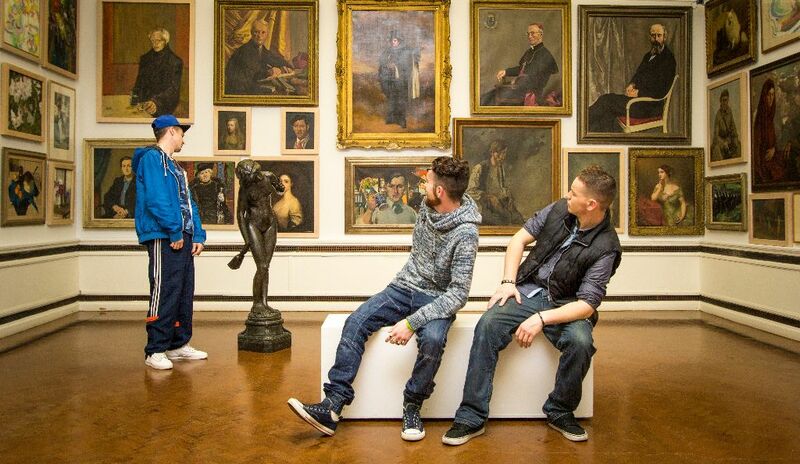 Rap and Hip-Hop seem to be gaining popularity in Limerick and Ireland in general over the last couple of years. Is it because it’s a genre that more and more people can relate to, especially for your generation? Well, Hip Hop and Rap has a wide variety of sound, and it is connected and influenced in so many cultures and is impacted by people who listen to different things, and at different times. It is now being greatly noted in the Limerick and Ireland and I think that before musicians in this genre were not getting themselves out there and not being ‘’seen’’ by an audience enough. But honestly, the music that has come out over the last 2 years has been especially good. Not to blow our own trumpet too much, but we have made an impact as you said, and we are very proud of our style of music and the work put into creating it. Would you class yourselves as angry young men or acutely observant about life growing up in a city that was deeply affected by the recession and our severely high suicide rate? Well, to be honest, I would have to say both. We are constantly noticing and discussing things that are happening around us, and seeking the answers so we can express our point of views. Having said that, as you hear in our music, yes we display a lot of anger, from events that play out in Limerick to issues around the world. We feel anger, annoyance and sadness towards how things are handled around the city and country. Of course our music is our expression, art and message we use and love to demonstrate what we really think of the matters that affect others and ourselves every day. As a group, you have a good platform to talk about life in Limerick, what message are you trying to convey to your audience? Well of course there is no one answer to that question. We’ are trying to show people how to break the cycle. Why should we be pigeon holed as one thing or another, or why should be stand back when something happens? Our message is to fight for yourself and your loved ones. It’s all about the power of speech! Use your words! You recorded your EP ‘Basic Instinct’ with mynameisjOhn and Naive Ted, and released it in September. Tell me about recording and releasing the EP – I love the Traditional music mixed with beats that you have in a few of your songs. Do you think it’s time that it was recognised in the Rap/Hip-Hop community worldwide? Oh yeah, definitely! The progress over the last few years was immense and now people all around have found themselves as artists more, and are now ready again to do something great!